Instagram is a great place for brands with highly visual products to connect with consumers. Instagram has been nipping at Twitter’s heels. As the visual network gains more active users, they are demonstrating higher engagement with both brands other users. Data collected and analyzed by Simply Measured breaks down where Instagram is gaining the most. Twitter is still in the lead, with 241 million monthly active users. But Instagram has already reached 200 million, despite being three years younger than Twitter. And because of its visual nature, Instagram is a great place for brands to advertise. 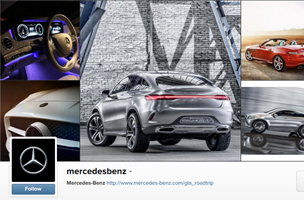 In fact, automotive, media and luxury brands fare best on Instagram, according to Simply Measured. “Automakers like Mercedes-Benz and Audi (along with media brands like MTV, and luxury brands like Tiffany & Co.) find success on Instagram due to their extremely visual products and masterful harnessing of them for user appeal,” wrote Lucy Hitz, social media writer for Simply Measured. Meanwhile, Twitter excels when it comes to engagement with retail, restaurants and media. What this means for brands is that there are big gains to be made by developing campaigns tailored for each network. Hitz used MTV as an example. The television network has accounts on Facebook, Twitter and Instagram. While Facebook users appear the most-engaged, their Instagram audience is growing at a faster rate. Indeed, MTV’s Instagram audience grew 0.7 percent from April 4 to April 10, almost double the growth on Facebook and Twitter combined. According to Hitz, MTV has made the most of each network by targeting Instagram with behind-the-scenes pictures, posting video content on Facebook and posting blog content on Twitter. For more information on the best kinds of content and strategies to use on Instagram, visit Simply Measured’s post.